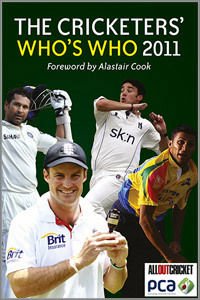 The Cricketers’ Who’s Who 2011 has been taken over and revamped by All Out Cricket. In Editor’s Matt Thacker’s words, All Out Cricket is taking stock before deciding upon the format for 2012. Readers will notice differences. Some of the light-hearted comments about players have disappeared after AOC’s research found that the surveys had not always been completed by the players themselves so their absence is completely understandable. On every player’s page – or, in some cases, two – is a statistical resume, a brief profile, an AOC profile and a Last Word profile written by someone known to the player and a photograph. The AOC profiles are impressive studies of each player which are not only well written but also well balanced and readers will surely learn a lot about the players from them. Matt Thacker points out that a lot of canvassing went into changing the format from an alphabetical listing to one where players appear under their counties. The subsequent player index at the end of the book may come in useful if, initially, a player cannot be found. The lists of the possible Sri Lankan and Indian tourists will be very useful and is a welcome addition as are the listings for the Unicorns, Netherlands and Scotland thus covering all bases for this season’s players. The Umpires are also well represented. The Roll of Honour section showing the 2010 season in figures is very well presented and detailed as is the introduction given to each county and their First-Class figures for 2010. I warmed immensely to the way in which All Out Cricket has produced the Cricketers’ Who’s Who 2011 and am sure that it will continue to be an invaluable reference book for cricket supporters.